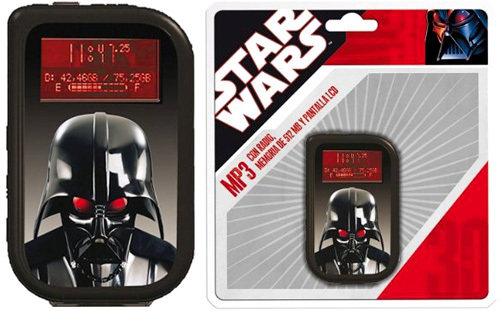 Star Wars MP3 Player… Lame! | OhGizmo! Listen Vader, I don’t know how to break this to you, but your ‘Planet Destroying Moon-Sized Space Station’ division is doing a lot better than your ‘MP3 Player’ division. I mean seriously, this is the best they could come up with? I’m sure you’re flattered they decided to use your image on the front (when did your eyes start glowing red btw?) but the LCD display looks like it was taken from an Iomega HipZip and it only comes with a paltry 512MB of storage. Currently the Amazon.co.uk website lists the Star Wars MP3 player as being out of stock (surprising, I know) and for some reason they don’t show the price as a result. But if it’s anything more than ‘free inside a box of Droids cereal’ (they still make that right?) then you’re getting ripped off. So, then we take an ipod and put a Yoda or Han Solo sticker on it and it becomes automatically an Star Wars ipod????????? ?